The callas pdfToolbox Services application is only available for Windows at the moment. 1. Ensure there is an installation of callas pdfToolbox Server/CLI on the system and the application has been activated successfully. 2. A special executable, which is needed to run pdfToolbox as a service, is located in /cli/var/Service. Copy the executable into the subfolder "/cli" of the application folder of the server installation. Please confirm the security question of Windows if shown. 6. 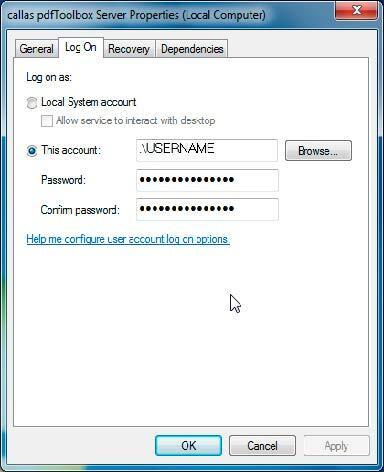 Select "pdfToolbox Server" and use the right-click menu item "Action" [or "Properties" depending on the Windows-version] in order to use this service and set in "General" the "Startup Type" to "Automatic" or "Manual". When "Automatic" is choosen, every started job will continue processing, even when no user is logged on the system. It will even start processing, when the operating system is started. When using "Automatic", also user details have to be entered into the "Log On" tab. It must be ensured, that all folders used in the jobsettings can be accessed by the defined user (especially when network paths shall be used by the job). Now a job can be configured using the ServerUI, which can be accessed using the Standalone version (Menu: Tools - Server). When a job is started, pdfToolbox Standalone can be closed. The services apllication ensures, that the processing will continue even when the user is logging off. If a job is using network paths for the used folders, it is recommended to use UNC paths (e.g. "\\192.168.1.22\hotfolder\...") as an assigned drive letter (e.g. "H:\hotfolder\...") is user-specific. It is possible to connect to a Server running as a service by remote via the local network. Enter the IP of the remote server where the service is running. The pdfToolboxService.exe has to be in the same directory like the pdfToolbox.exe (like when installing the Service). If network paths are used for processing jobs, the user should have sufficient rights to access them. There may be special requirements for converting Office files to PDF when using pdfToolbox as a service. Check http://www.callassoftware.com/goto/tbx_ENU_topdf for the latest details.